Thanks to the Ryan Plan we now know 86% of Americans LOVE Medicare, so one can only assume they would love it even more if they all actually had it. I took a good look at the mean, ignorant hate-mongers on the other side. The vote was a win against them. Yesterday I found myself rooting for the passing of the healthcare bill. It is a horribly compromised bill; losing would have been worse. I am glad it passed. Today, as insurance companies' stock soar, the battle for single payer starts again. Let's compliment Arianna's "Move Your Money" campaign and make owning health insurance shares politically incorrect. The pitch and claim for the public option is "keeping the insurance companies honest." Really? If I break the law, I get prosecuted, fined, and jailed. It's that simple - do the crime - do the time or pay the fine. That should keep them honest. Congress passes laws, and if they violate them or cheat they are out of the game. The second pitch for the public option is cost control. According to the President, if you like what you have, you can keep it. If you hate what you have, you are stuck. In other words, the public option is nothing more than a tax subsidized high risk/low income health care subsidy, and like Medicare - a limited admission club. The rest of us, like me, are thrown to the wolves. If the true purpose of the public option was to control cost, it could be done with the stroke of a pen declaring insurance companies a public utility, like AT&T or your electric company. If the mighty AT&T and Edison can be subjected to this level of price control and regulation, why not the insurance companies? The answer, once again: Wall Street greed! Insurance companies' shares and their obscene profits are a big, fat part of all our portfolios and our retirement plans, including unions' retirement plans and the pension funds of all our cities and states. Wall Street, having seen the plunge of Lehman Brothers and AIG, has no intention of allowing health insurance companies, the most profitable of them all, to go down the drain - no way. Maybe this explains why, when 65% of the voting public wants health reform, we get insurance reform; instead of transformation we get regulation. No maybe about it! This is why none of the other high power corporations, automakers, GM, the usually liberal Hollywood studios, just to name a few, and all our Senators, Republican, Democrat, and even President Obama, are not demanding single payer. Their executives and their unions, their cities and states, their school boards, also own a piece of the insurance pie. Do you have a pension fund, mutual fund, an IRA, a 401k? Congratulations, you too own a piece of a health insurance company. Protecting such investments can be a costly trap. Investment saving comes after necessary expenses, including healthcare. After years of paying an absurd amount of money in premiums, if I ever get sick (I will one day, we all do) - I will go broke in a blink anyway because those premiums, co-payments, and deductibles have made saving a dream away. Unless we demand healthcare as a basic civil right, the tangled web that is in so many of our pockets will forever keep us trapped. Reaching our goal of universal healthcare under a single payer system should not take a huge toll on everyone's savings, so let's divest. 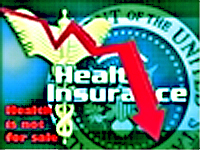 Let's all call our brokers, our pension funds administrators, our banks and divest from health insurance companies. Call your school board, your union, you mayor, your college, your governor, your employer, and ask them to divest their pensions and investments from all health insurance companies stock. Just like they did once with South African gold coins, or today with Sierra Leone conflict diamonds, all major institutions refused to trade in inhumanity. Let's add the health insurance companies to the list of politically incorrect holdings. First, make sure you dump your own, then start writing, calling, and campaigning within your own communities, unions, cities, schools, etc. If we remove the risk of a big down slide for all of us and all of the big, powerful investors on Wall Street, the strong resistance to single payer healthcare will subside as the demise of the health care insurance companies becomes less of a real financial and practical threat to the financial system. The Public Option is hardly an option, it covers, at best 5% of us, when Obama says, if you like what you have you can keep it, the most important statement is lacking: if you hate it, you can leave it. All the PO does is to create another entitlement for people to resent. If the goal were to control costs, all we need to do is declare insurance companies a public utility, a mandate without price control is untenable. Single payer is all inclusive, thereby creating less resentment and can be explain in two sentences: This is how it works. You pay your premiums through payroll withholdings, just like SSI, Medicare, etc. and you get the care free. By eliminating the middleman, you pay a lot less and doctors get pay better. Single payer is actually an easier sale, as it answers that very human question: "What's in it for me?"